This weekend I have been catering for a union between a delightful Canadian young bride and her very English groom. The setting was the divine Old Rectory in Aston Somerville near Broadway, in the heart of the Cotswolds. The marquee was set in the fabulous gardens and we were lucky enough to have a whole weekend of glorious sunshine. 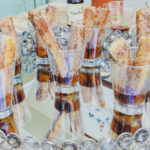 I created two new wedding canapé recipes for this celebration which went down extremely well, so I thought I would share them with you here so you can try making them yourself. Firstly, the Caesar; the Canadian version of our very own Bloody Mary cocktail, the Caesar features Clamato juice. If you’ve not come across this before it’s tomato juice flavoured with spices and clam broth. The Caesar (or Bloody Caesar) was invented in 1969 to celebrate the opening of Marco’s Italian restaurant at the Calgary Inn and is inspired by the flavours of Spaghetti Vongole (spaghetti with clams). 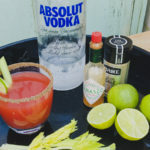 It’s seasoned in a similar way to the Bloody Mary and served in a tumbler where the rim is moistened with lime juice before being dipped in celery salt. We served these as a canapé drink on the Sunday. We also prepared Summer Vegetable Frittata, Sausage & Bacon rolls and the most divine French Toast with Canadian Maple Syrup. 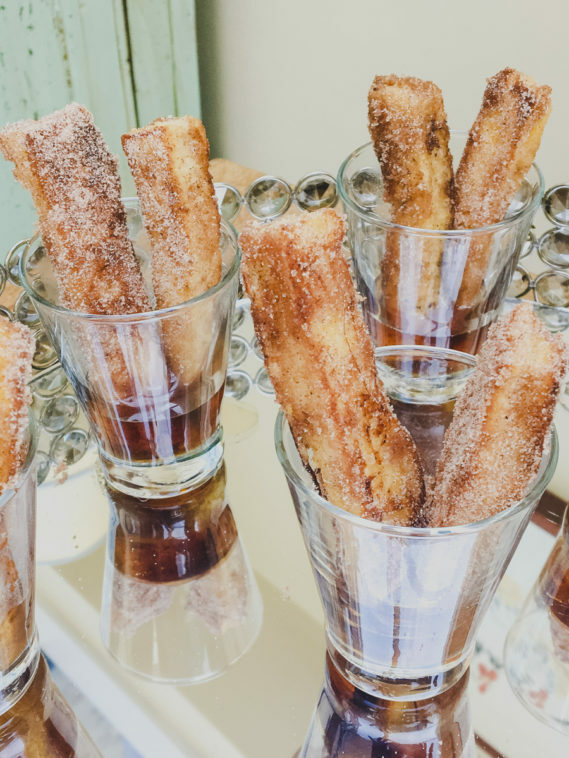 Imagine pretty shot glasses stuffed with cinnamon sugar-dusted fingers of eggy bread resting in a puddle of golden brown maple syrup. Funnily enough they disappeared extremely fast as one is never enough! Squeeze a wedge of lime around the rim of your glass and then dip the rim in celery salt. Add the vodka to the glass, pour in the clemato juice and then season with Worcestershire Sauce, tabasco and a little lime or lemon juice. Add a stick of celery to garnish and enjoy drinking your Caesar through the rim of celery salt for a truly Canadian experience! Beat the eggs together with the milk and vanilla extract. Combine the sugar and cinnamon and pop it into a shallow tray. Melt the butter in a non-stick pan. Dip each finger of bread into the eggy mixture and the put into the sizzling melted butter. Just like eggy bread, the fingers will turn golden brown, and will need turning. When each bread finger is a delicious golden brown on each side, remove with a slotted spatula and toss in the sugar and cinnamon mixture. Serve these yummy treats with maple syrup and bacon. Don't leave the bread in the egg mixutre too long as it will turn soggy.